Prom Tickets will go on Sale Tuesday, April 23rd through May 2nd during lunch. Tickets are 1 for $15 and 2 for $25. Congratulations to Hailey Bolte, Carlee Ernst, Alexis Gibson, Sydney Hoehl, Madison Throne, Billy Beckham, Jeremy Frazier, Alex Pastrovich, Sam Painter, Ethan Washburn for making Prom Court. Congratulations to the students that received perfect attendances for the month of February. They each received a gift donated from Casey's. Congratulations to the newly inducted NHS students! 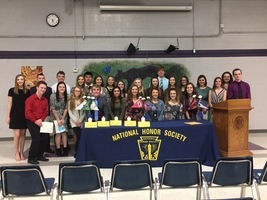 Last night, 18 Juniors got inducted into National Honor Society. They joined the current 8 returning seniors NHS members.